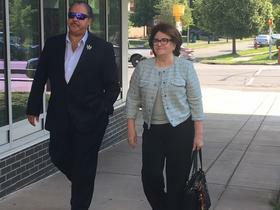 BUFFALO, NY (WBFO) – New York State Education Commissioner MaryEllen Elia is speaking out against a proposal to use federal dollars to buy guns for educators. 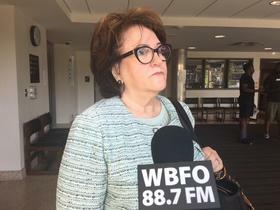 WBFO’s senior reporter Eileen Buckley got reaction when Commissioner Elia appeared in Buffalo Friday. “That is just beyond the pale to think that that’s just something that’s reasonable. It’s atrocious and really, I think, ill-conceived,” Elia declared. Commissioner Elia is outraged U.S. Education Secretary Betsy DeVos’s eyeing a plan to allow states to use federal grant dollars to buy guns for school teachers. The Education Department wants to use Student Support and Academic Enrichment grants, which have a loophole that would allow the purchase of weapons by states. Elia tells WBFO News teachers should not have to worry about having a gun in their desk. “Why would we think that it is alright to expect teachers, who have so many other things on their plate to do to support kids, have to have and be thinking of a gun that’s in the drawer,” Elia responded. Commissioner Elia made her remarks while appearing Friday morning at McKinley High School for a Buffalo Public School District, city-wide high school graduation ceremony. Elia said the federal grant funding is designed for students, not guns. “Those funds are identified for students who are ‘at-risk’ and it provides teaching and learning resources for them and I think it’s absolutely ludicrous that we would ever consider using those funds that are tight enough in our state for all the needs of our students to provide guns and then, even beyond that, to expect that our teachers are going to be ready to pick up a gun and in some way protect their children. This is not what we need to do in education. Our teachers have so many other responsibilities,” Elia remarked. The State Education Department, the New York State Board of Regents and the state’s largest teachers union, New York State United Teachers, are all ‘adamantly’ opposed to arming teachers. “It’s worse than reckless. It’s dangerous. Deadly weapons don’t belong in classrooms full of little children, in the hands of educators who have stated repeatedly that they don’t want them. Classrooms should be safe refuges for students, where caring educators can nurture their love for teaching and learning. At NYSUT, we will continue to work toward that goal, supporting sensible safety measures that are embraced by educators and their local communities. This idea is a distraction,” stated New York State United Teachers President Andy Pallotta.